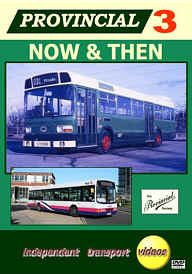 Continuing our Now & Then theme we come up with a real exclusive! Former Gosport & Fareham 36 (HAA 771E) the last remaining Guy-Duetz with Reading H56R body was tracked down to California U.S.A. by well known ‘Provincial’ bus preservationist, David Whitaker. David made a visit to America to travel on her and whilst there he captured her on video for us. itv would like to thank Bob Gray, David Whitaker, Fred York and Clive Wilkin for the loan of material for this production.